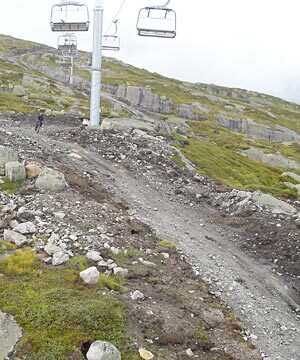 Next summer Sirdal Alpint at Tjorhomfjellet in Sirdal plan to have downhill mountain biking and if you are a good, experienced downhill mountain biker, and would like to try out an unfinished run this weekend, then you might like to know that the chairlift will be running 23 and 24th September, from 12.00 to 16.00 - and it will be free! Mountain bikers should not try this now unless they are experienced and not afraid of a tumble on rough unfinished tracks - at their own risk. A group of experienced downhill cyclists has already tried out the route, and are looking forward to next summer. You may also be interested to check out the walking options up on the top - this will also be available next summer. This will be a good opportunity to see what to expect this winter and next summer. A new - steeper - main run down is being constructed, by-passing the flat section that caught out slow snow-boarders last winter. Snow cannons will be in place all the way to the top - which hopefully will allow a much earlier start to the season this year.